Snoopy, of course, is a beagle. We know this because it's repeatedly referenced throughout the comics and cartoons. Marmaduke is a great dane. We also know this since it's referenced in the strip. Fred Basset is a basset hound -- it's mentioned in his name! What type of cat is Garfield, though? Or Heathcliff? What kind of dogs populate the cast of The Dogs of C Kennel? As far as I'm aware, their breeds have never been mentioned. And the impact on their stories? None at all. 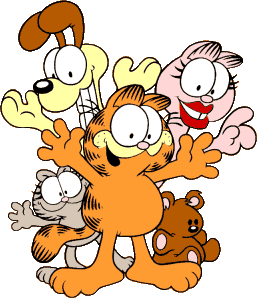 In fact, I'd be willing to bet that most people never even thought to consider what breed Garfield might be; it's that inconsequential to the story. So why would you care about what "breed" of humans are in any given story? I'm not saying race is inconsequential and we should be completely color-blind to it, but it doesn't have to impact every story. Marmaduke's great dane-ness is relevant to the stories Brad (and later Paul) Anderson want to tell. Garfield's specific breed doesn't appear to hold any interest to what Jim Davis is trying to say, so it's non-issue there. Readers have innately understood that and, consequently, don't care. So why should you care that Hulk is Asian? Or Captain America is Black? No one seemed to give a damn when Psylocke got switched from British to Japanese -- since race wasn't an especially significant part of the stories being told at that time -- so why would it matter now? Okay, a couple of responses. First, the nerd response: I'm pretty sure that Garfield is a tabby. I have some memory of Jon singing of his "orange tabby" in an episodes of Garfield and Friends, and an even more vague impression that that the phrase "tubby tabby" turned up in some kind of Garfield story at least once. I sense that there is probably so, so much baggage to unpack there. Maybe a worthwhile project if your library includes some of the material. If Garfield is indeed a tabby, I don't think it invalidates the argument. It's certainly not as well known as Snoopy's beagle-ness, probably since it's not brought up very much. And it's not brought up very much because it's irrelevant to the stories Jim Davis is trying to tell. He could've made Garfield a Siamese or a Ragdoll or a Russian Blue and it would've made zero difference (aside, perhaps, from an occasional 'tubby tabby' reference having to be reworded slightly). As I recall, Psylocke switching from British to Japanese was largely due to a new artist (I want to say Jim Lee?) taking over the book and just drawing her more Asian-looking. When readers started writing in say, "What gives?" someone (Claremont? Nicieza? Lobdell?) crafted a retcon story where there was a body-swap/mind-switch thing to explain the differences. I seem to recall someone over at Comic Book Resources (their Comic Book Legends column maybe?) writing this up in detail, and there are some allusions to it in Psylocke's Wikipedia entry. Re: Garfield, oh yes, entirely valid points. Re: Psylocke, wow. I had to go look this up. So far as I can tell, the Comic Book Legends item disputes that version. Either way, though, it still seems like there is an awful lot of baggage packed in here. Even if the CBR version is completely accurate, someone somewhere presumably had reasons for suggesting a rumor to the contrary. Anyway, cheers, thx for the note.